December 9, 1887. An impression of the County seal (Grapes) was authorized to be sent to the secretary of state. June 13, 1939. 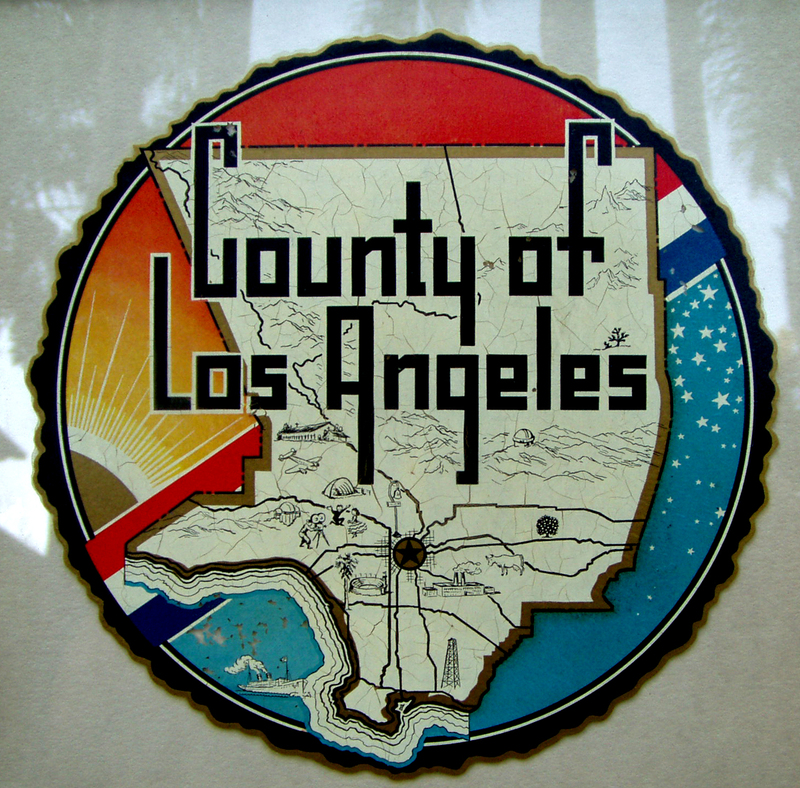 On motion of Supervisor Hauge, the Board adopted a resolution ordering that all County cars be suitably labeled by an appropriate insignia; that said insignia should be in keeping with the dignity and the importance of the County of Los Angeles; and said insignia should depict and properly display commerce, shipping, agriculture, airplane manufacturing, the motion picture industry, the petroleum industry and recreation and use the outline of the County; and in order to attract available and proper talent for the drawing and makeup of the proposed insignia, proper publicity should be given. The sum of $100 was to be appropriated from the General Fund unappropriated Reserve, 1938-39, to be offered in payment of the best and most suitable design for such insignia as determined by the Board. June 28, 1939. The Board authorized the closure to accept insignias from contestants effective July 5, 1939. August 10, 1939. The Board accepted the design submitted by Orpha Klinker for an insignia to be placed on County equipment and authorized the payment to her of $100; also County Counsel was instructed to prepare a contract of release and assignment to the County all copyrights privileges. August 15, 1939. The Board rescinded the order adopted on August 10, 1939, in relation to the design submitted by Orpha Klinker for insignia to be placed on County equipment; and approved the design of Orpha Klinker, and authorized the purchasing agent to purchase, together with all rights to use, at a cost not to exceed $100. January 2, 1957. The Board adopted a new seal designed by former Supervisor Kenneth Hahn, drawn by Millard Sheets, with implementation effective March 1, 1957. February 23, 1960. The Board rescinded all previous orders concerning placement of the County insignia or seal on County district cars; and ordered the placing of the County seal or appropriate special district seal on all automotive equipment under the jurisdiction of the Board of Supervisors, with some exceptions. September 14, 2004. The Board approved a modified version of the seal after the ACLU, claiming it was illegal to include the cross on the seal due to its religious nature, threatened to take the County to court. In the redesign, not only was the cross removed, but also the oil derricks and the Goddess Pomona. Some members of the public had criticized inclusion of the pagan Goddess Pomona if the cross was to be removed. A native Indian woman replaced her. The oil derricks were removed to make room for a mission, which was added to take note of the settling of the area by the Spaniards. The decision to change the seal was so controversial that residents several times circulated petitions to allow a public vote on the matter, but they were unable to obtain enough signatures to put the issue on the ballot.